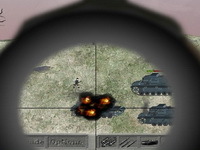 Keep your base safe from the huge advancing enemy armies using your trusty sniper rifle, air strikes and artillery. In the action shooter Operation Fox you fly in a helicopter over enemy territory. Your mission is to eliminate all enemy activity. This is a 2D, horizontal scrolling shoot’em up in the spirit of classic games such as R-type and Gradius. Play as a small, round mech, Dizzy, and his human co-pilot, Charley, in a search to find and rescue their friends after an alien invasion. The Game features five areas all with completely distinct, parallax scrolling backgrounds and each with its own unique, multi-staged boss. It also features over a dozen unique enemies to destroy. This is a dense game, and if it’s not enough, unlock new game plus mode for an even greater challenge. Farm money by playing or replaying levels, and buy a variety of weapons and equipment to ease your struggle. Also buy and deploy “pods” which are small floating entities that attack or provide utility.